The Tanner sisters must find a way to outshine some not-so-friendly competition—and keep the Sparkle Spa in the spotlight!—as school picture day approaches. It’s almost time for picture day at Auden Elementary School, and the Sparkle Spa will make sure everyone looks picture perfect. But Aly Tanner’s arch rival, Suzy Davis, decides she knows how to make everyone look even better than Aly and Brooke do. Suzy will set up “shop” in the girls’ bathroom at school and let everyone use lip gloss and blush and mascara. 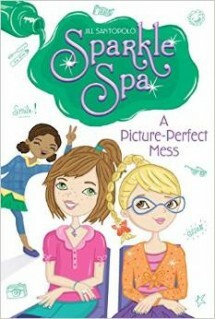 Will Suzy’s plan really outsmart—and out sparkle—the Sparkle Spa? ← Sparkle Spa: Bling It On!